In this tiny slice of India, an unbelievable wealth of history, culture and colour surrounds you. Immerse yourself in the grandeur of iconic monuments in Delhi and Agra, or inhale the beauty of Rajasthan’s majestic hilltop forts. Spend an unforgettable night in a deluxe tent in the vast Thar Desert and meander through the vibrant hues of a lively Jodhpur street bazaar. 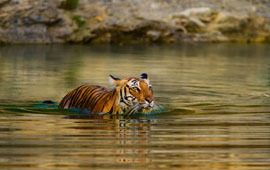 Spot wildlife from a jeep in rugged Ranthambore National Park and delight in the region’s sumptuous cuisine. 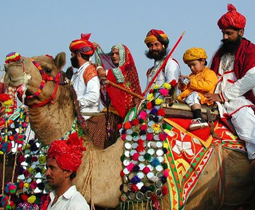 Your visit to Rajasthan will astound. 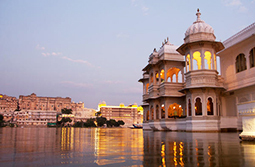 Starting off from India’s capital New Delhi, touch base at Udaipur, also called the city of lakes; an emerald jewel snuggled amidst arid land. Move on to the dry and barren regions of Jodhpur and Jaisalmer before heading off to Bikaner to complete the Rajasthan triangular circuit. Head off to Jaipur the Pink City, Jaipur before heading off for Agra to witness a poetry in stone, the ever so beautiful monument – the Taj Mahal. Culminate your visit with the journey back to New Delhi. Arrival at Delhi. Welcome at the airport and transfer to hotel. In the afternoon tour of Old Delhi. It is a 17th century walled city with its splendid gates, narrow alleys and the enormous bazaar. 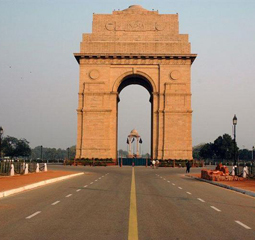 Then visit New Delhi which is in complete contrast with Old Delhi with wide tree lined avenues, parks and fountains surrounding the imposing Government and State buildings. Overnight stay at the hotel. Morning leave for Jaipur. Stop enroute and visit Amber fort. Ascend by painted elephant upto the fort with its huge gateways and Pillared pavillions, visit Marble palace, temple of victory and Sheesh Mahal.Afternoon check in at the hotel. 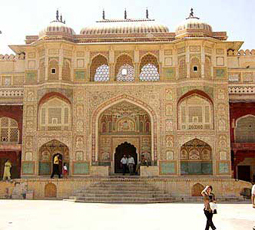 Jaipur city was founded by Maharaja Jai Singh in 1727. It is a magnificent planned city built of rose - pink coloured stones that is why it is also called as "Pink City". Overnight stay. Morning city tour of Jaipur visiting City Palace, museum and nearby is the ornate Hawa Mahal (Palace of winds) which is five stories high and is decorated with delicate screens carved from stone. Also visit Jantar Mantar observatory which is still equipped with immense brick and mortar instrument including a very accurate 90 feet sundial.Rest of the day free for shopping. Overnight stay at the hotel. Morning transfer to Airport to catch flight for Jodhpur. Arrival at Jodhpur airport and transfer to hotel. Visit Meharangarh Fort built in 1457 A.D. It has a high stone wall protecting the well fortified city. It has rich collection of Palanquins, elephant howdahs, musical instruments, costumes, furniture and armory. Afternoon visit Mandore Gardens. Overnight stay at the hotel. Morning leave for Jaisalmer. After arrival check in at hotel. Jaisalmer is an architectural dream in the lonely yellow silence of the desert and where you have the feeling of still living in medieval era. Overnight stay at the hotel. Morning city tour of Jaisalmer visiting Fort, Patwaon Ki Haveli and Nathmal Ki Haveli which are famous for wonderful carving. Afternoon free to explore the desert town on your own. Overnight stay. Morning leave for Jodhpur . On arrival check in at the hotel. Rest of the day free for leisure activities. Overnight stay at the hotel. Morning transfer to Airport to catch flight for Udaipur. Arrival at Udaipur and check in at the hotel.Overnight stay at the hotel. Morning city tour of Udaipur visiting City Place and museum. Each Palace within is an outstanding creation of art. Also visit Jagdish Temple, Saheliyon Ki Badi and Bazars. Afternoon excursion to Eklingji which is known for 8th century Family Temple of Maharajas of Udaipur. Also visit Nagada nearby famous for another 9th century temple. Overnight stay. Morning transfer to airport to catch flight for Mumbai. Arrival at Mumbai and transfer to hotel. Mumbai is called Commercial Capital of India. Overnight stay at the hotel. Morning city tour of Mumbai and afternoon transfer to Airport to catch flight for onward destination.